A staggering 90% of carpets in homes are not installed correctly! 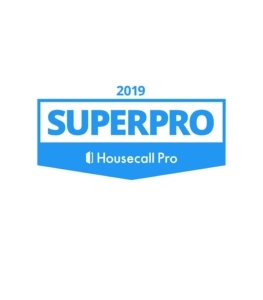 The manufacturers recommend that the carpet is installed with a power stretcher to the specifications set forth, however most hurried installers drop the carpet in and use only a knee kicker to install. 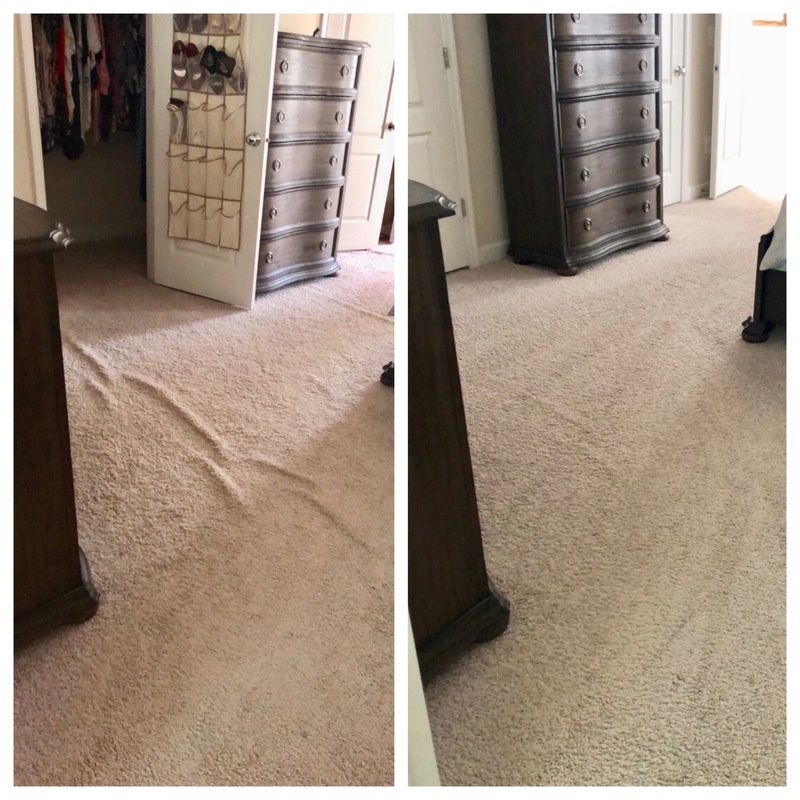 This may look great for the first year or two, but after time wrinkles will appear because there is too much carpet in the room. 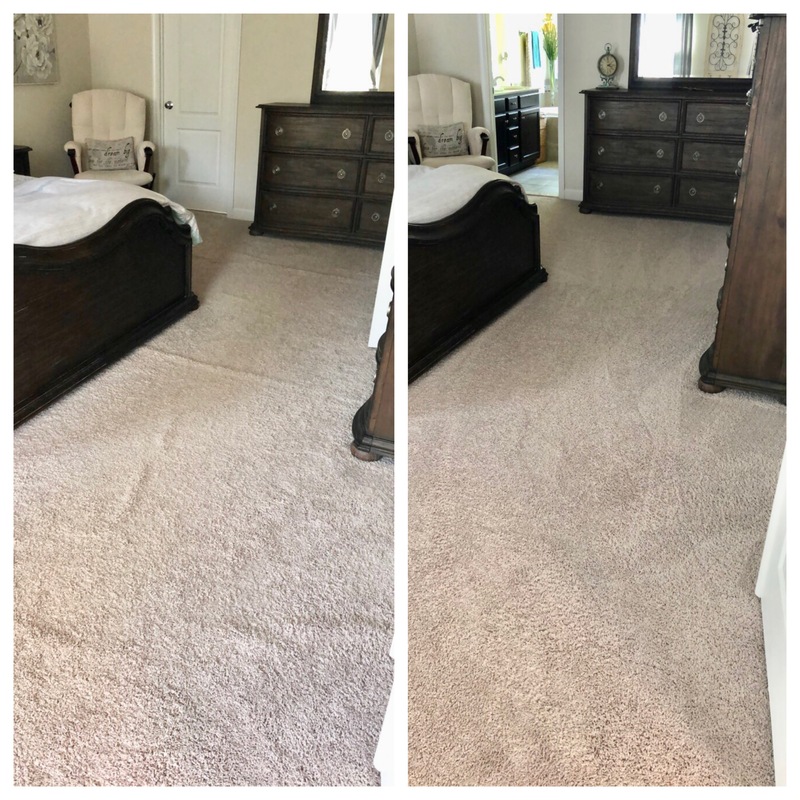 The carpet will need to be disengaged from the tack strip along the walls, we then use our power stretcher to stretch the carpet out to the perimeter of the room and trim anywhere from 1 to 3 inches of carpet from the edge, then re-tuck under the base molding. This can be quite a project in a fully furnished home. When we come to do your stretching it is very important to clear all the smaller items out of the rooms leaving only the big furniture. Quite often when stretching a room we will need to access the closets, so the floor of the closets will need to be cleared as well. 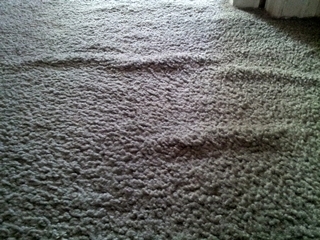 The carpet can be stretched as tight as a banjo string, however sometimes it is still visible where the wrinkle was. This will get better over time with vacuuming and foot traffic. Think of it as a piece of paper that has had a crease in it for 5 years, you can unfold it and stretch it out but you will likely always be able to tell where the crease was. 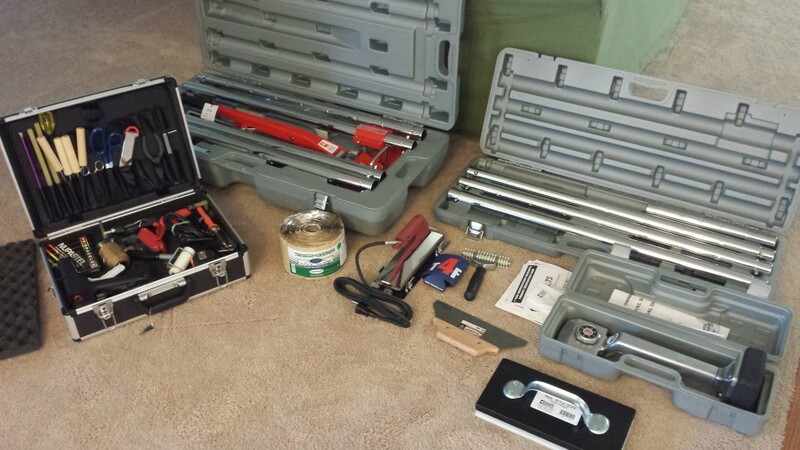 Pristines arsenal of carpet repair tools. 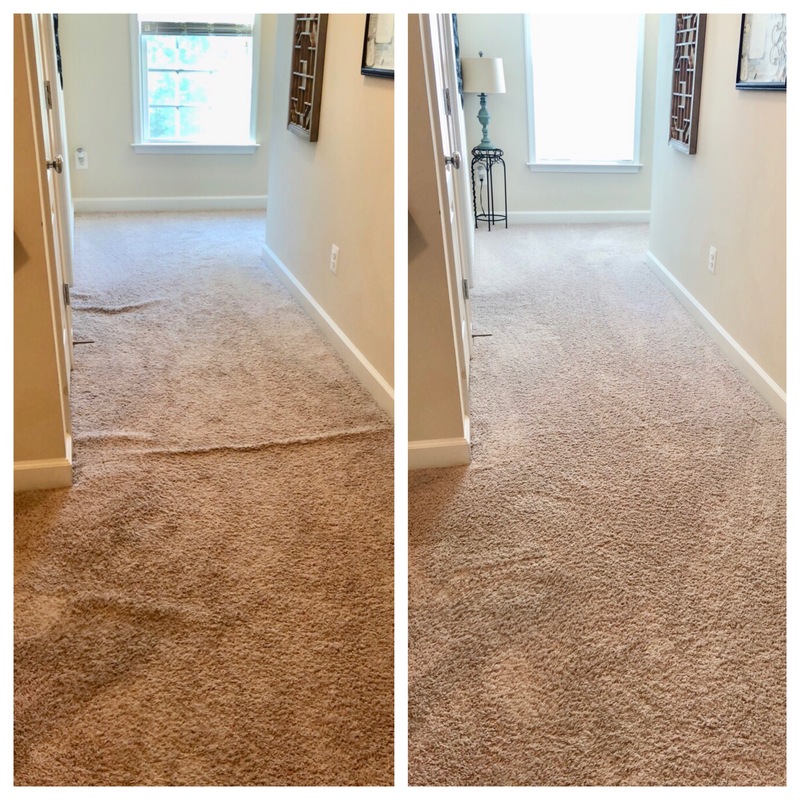 The most common carpet repair we do by far. Unfortunately we see some terrible carpet installs around Fredericksburg. 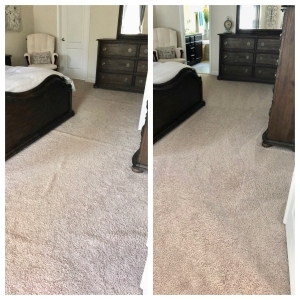 Many carpet installers just use knee kickers to kick the carpet on to the tack strips, it is impossible to use this method to achieve a quality job. Shaw Industries, the leading manufacture as well as Carpet & Rug Institute have strict guidelines as to how tight the carpet needs to be in order to perform properly, this can only be done by using a power stretcher. The problem is that installers that only “kick in” carpet can get it looking good, but the problem usally arises a year or two after they are paid and long gone. The wrinkles will first start to show in the traffic lanes mainly the “pivot points” the most common spot is in the hallway at the top of the stairs. 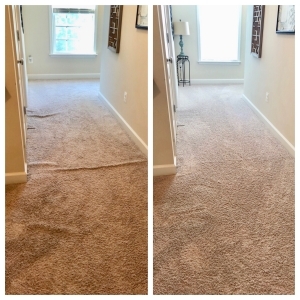 Traffic goes up the stairs and the foot pivots at the top, one way or the other causing improperly installed carpet to move and wrinkle. 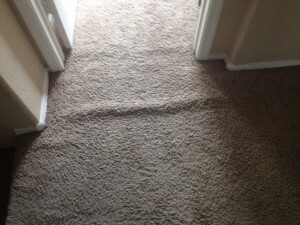 These problems can be fixed by using a power stretcher to tighten the carpet to acceptable standards. It’s hard to have a standard pricing structure for these repairs as they are all different and some need one or more seems to be re-done. 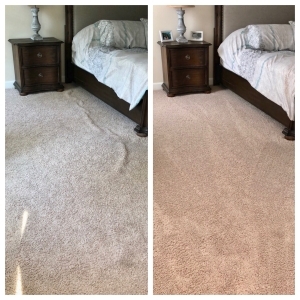 It is a good idea to have the carpet stretched as soon as you notice the problem because if left unattended the carpet can “de-laminate” meaning the backing can separate from the carpet causing permanent damage. When that happens, the places where the wrinkles were can usually still be somewhat visible even after the carpet is pulled tight. Much like a folded piece of paper will always show evidence of a crease where the fold was when un-folded. To get the buckles out of the carpet we have to pull the carpet off the tack strip around the perimeter of the room. We then use a power stretcher to pull the carpet tight, trim off the excess carpet and re-tuck.